New Recipes From Moosewood Restaurant appears to be one of the last comprehensive vegetarian cookbooks left on my list. I thought of putting it off, saving it for later so I wouldn’t have too long a run of Recipes of the Damned books. 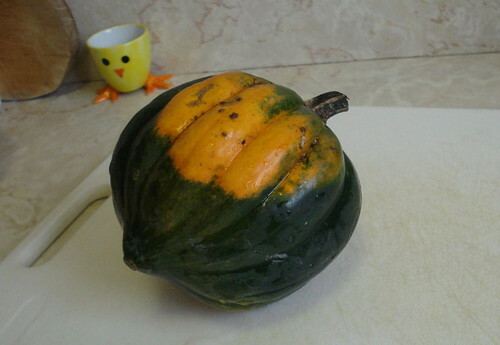 But I had picked up acorn squash at the Greenmarket and needed to find something to do with it. None of the other cookbooks yielded satisfactory options, but Moosewood came through. I may shed a tear later this fall as I wrangle Jell-O and canned pineapple, but it was all smiles at the dinner table last night. We have a houseguest, staying for a time while professional cleaners take care of smoke damage from a fire near her building. We’ve been indulging in a fair amount of Thai delivery, I admit, but we’ve also done some collaborative cooking, and last night we decided to put together a light and flavorful dinner. She contributed poached tilapia, rice pilaf and steamed summer squash, and I provided creamy squash soup and Middle Eastern carrot salad. 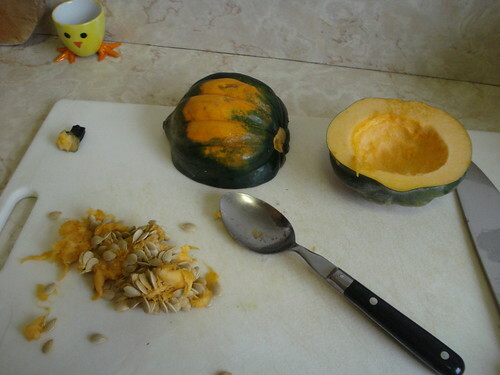 I started the soup by cutting an acorn squash in half and scooping out the seeds. 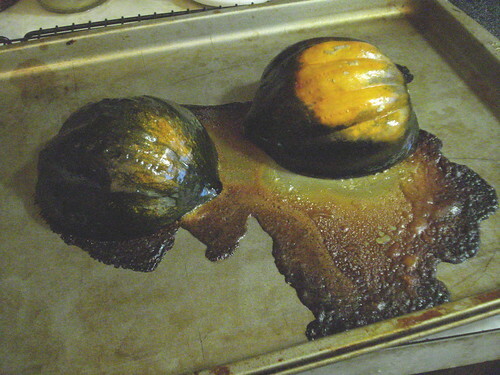 I rubbed some olive oil on a baking sheet and put the squash halves in the oven for an hour. 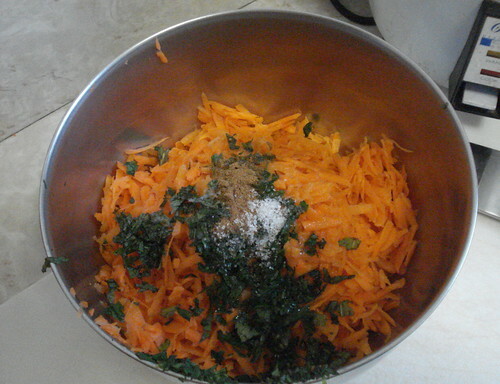 While it baked, I put together the carrot salad, which I’ll describe below. 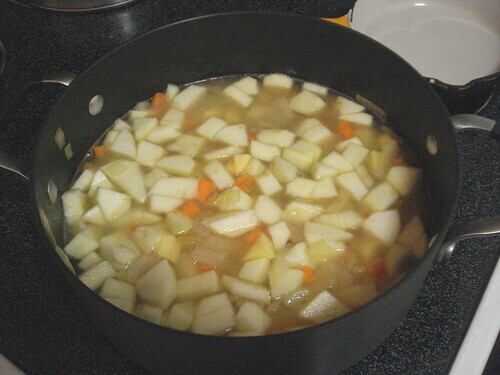 When the squash was done I set it to cool, and did my prep for the soup base: I chopped up a couple of onions, a carrot, a couple of small potatoes, and two Granny Smith apples. 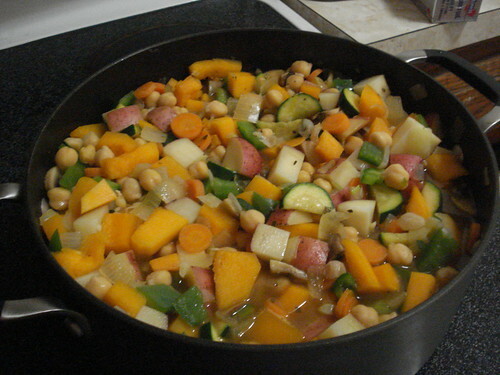 I heated some olive oil and sauteed the onions until they were soft and translucent, then added the carrot, potatoes and apples along with 3 1/2 cups of water. 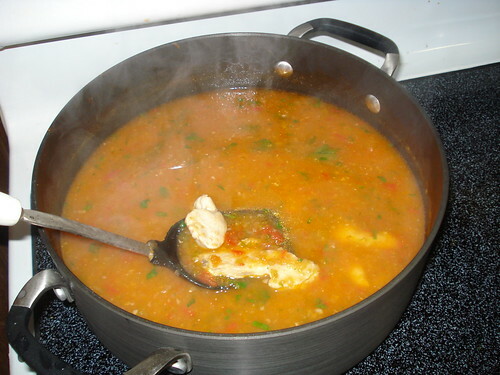 I brought this to a boil and let it simmer about 20 minutes, until the chunks were softened. 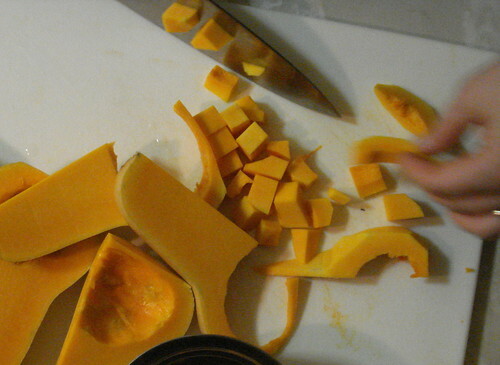 Then I added the squash, scooped out of its skin, plus 1 1/2 cups of apple juice (one could also use milk or cream, but our guest can’t eat dairy). Now it was time to do the magic. 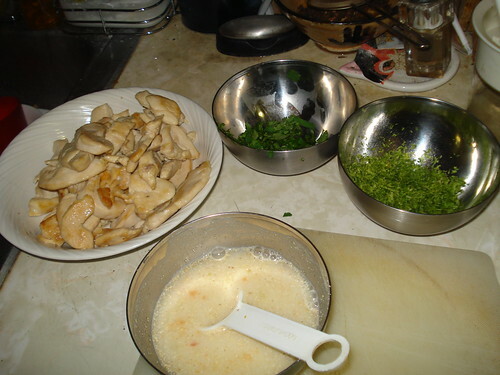 The directions say to combine all the ingredients and puree the soup in batches using a food processor or blender. I think our food processor is still out of commission, and there are a whole lot of things I’d rather do than transfer hot liquid back and forth from pan to blender jar. 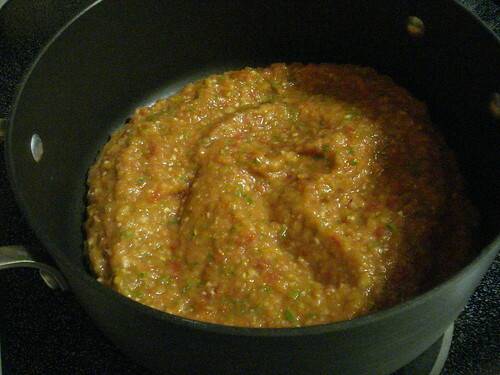 But I have an immersion blender attachment for my hand mixer, so I was able to puree the soup without dirtying any new vessels. Well, mostly; I had a very brief practical reminder that when you are using an immersion blender, it is crucial not to lift up the stick while it’s running. Unless you like mopping puree off random surfaces. 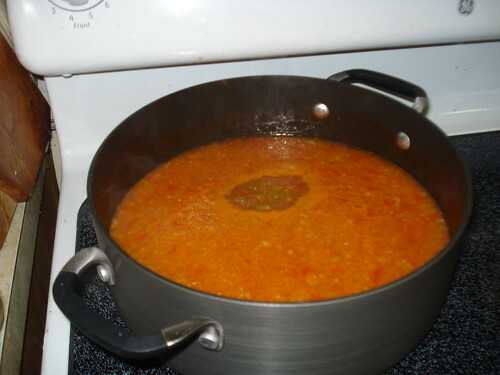 I lost very little soup to that, happily, and in less than five minutes I had a nice pot of smooth, pleasingly colored puree. I returned the pan to the heat, stirred in a bit of cinnamon and some salt and pepper, and let it keep warm while we got the rest of the dinner together. While the squash cooked I did all the salad prep. 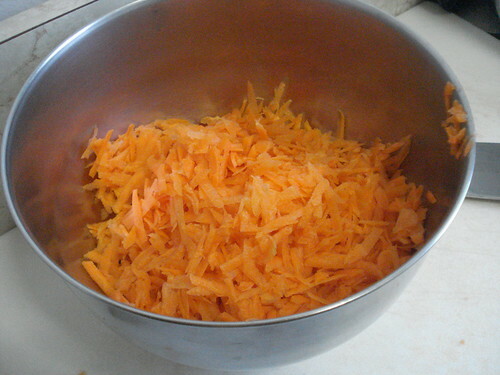 I had picked up some enormous, delicious carrots at the Greenmarket as well, and I spent a fair bit of time shredding them to produce four cups of carrot bits. 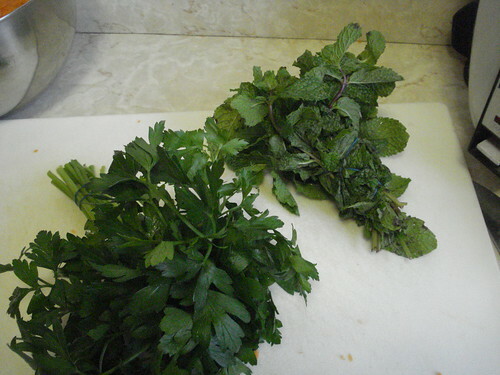 To these I added lemon juice, olive oil, ground cumin (it was supposed to be coriander but I was out and cumin is close enough in my estimation), chopped fresh mint, chopped fresh parsley, and salt. I stirred it all together, tasted, and considered: Did I want to add the optional touch of sweetener? 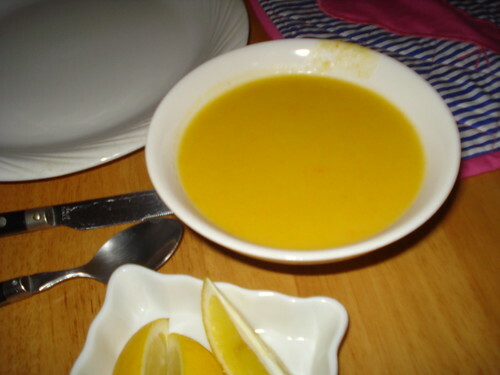 The mixture was fairly aggressive as it stood, with the carrots’ blend of bitterness and sweetness, the fresh burst of mint, the sharp tang of lemon juice. 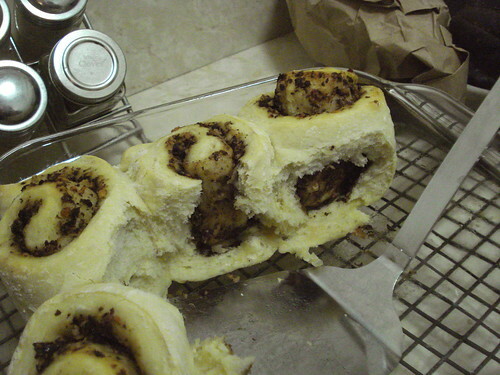 I decided to go for it, and stirred in a teaspoon of maple syrup, then tasted again. The difference was surprising; the sweet tones pulled together the more extreme of the savory flavors, and the distinct taste of maple played beautifully off the carrots. I stirred once more and put the salad in the fridge to chill. When the meal was all ready, I brought out the salad and spooned soup into small bowls. The flavor of the salad balanced nicely against the smooth, rich fish and the earthy rice pilaf, but the textural contrast was also a big part of its appeal. And the soup was surprising: sweeter than I had expected, it had a velvety texture that was light and not cloying but very satisfying. Verdict: Success. 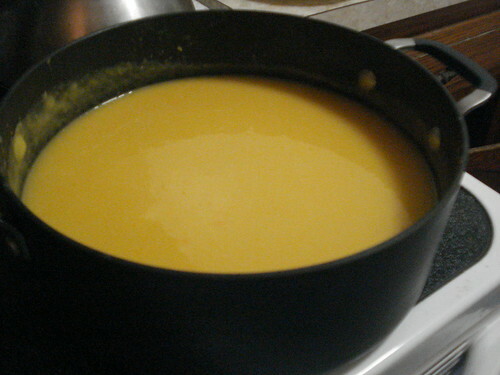 I should make up some more batches of the soup to freeze for winter. 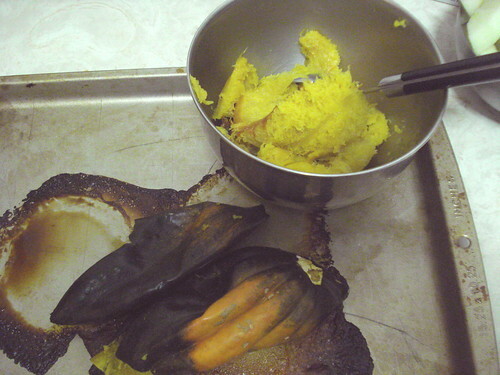 I have squash left. 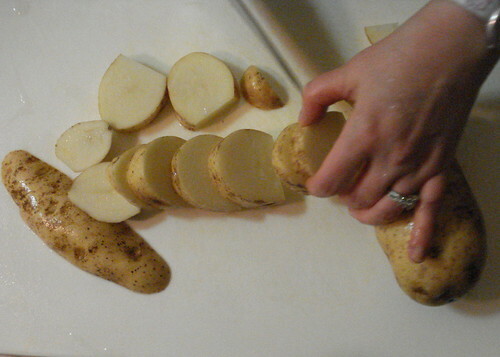 I can’t believe how long it’s been since I had a chance to cook for and post to this blog. Things have been a little hectic. And it’s going to be all the more challenging to meet my goal of cooking from every book by the end of June, but I’m going to try. This week will still be busy for me, but next week I’ll be on vacation and I ought to be able to do extra cooking and writing to make up some ground. 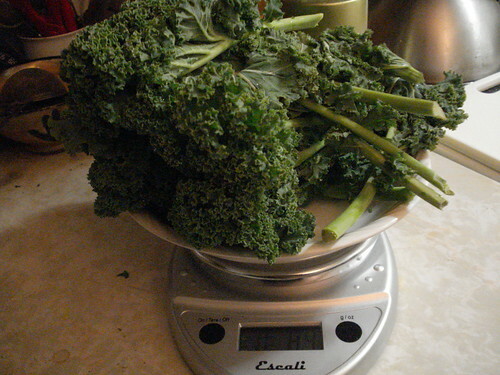 In the meantime, I needed to find something I could make for tonight’s dinner that wouldn’t be too complex. I leafed through Pure Poultry; it’s another cookbook from the cookbook club I used to belong to, and features the same attractive photography and layout as the others they publish. I flipped past familiar kinds of recipes — roast chicken, chicken cacciatore, oven-fried chicken — but then turned a page and found a beautiful photo of a rich-looking red soup flecked with bits of pepper and onion. Chicken chili soup with fresh lime looked perfect for a chilly spring evening. 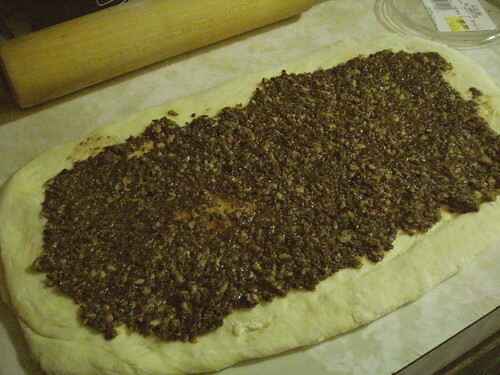 I started by doing my prep, but I should have read the recipe through once more and divided up my work. 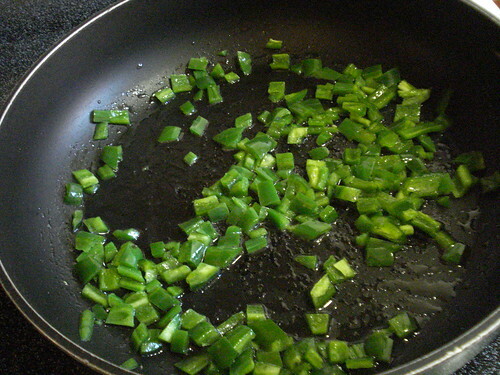 The first instruction is to heat some oil in a skillet, briefly fry a number of diced jalapeno peppers, and then cover the diced peppers with water and set them aside for half an hour. I could have chopped the peppers first and cooked them, then moved along with the rest of the chopping while they soaked. So dinner was a little later than I’d intended. 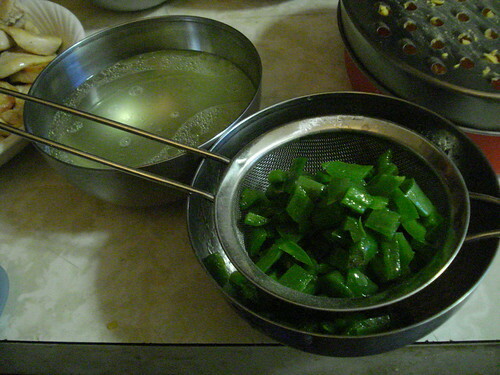 Once the peppers have soaked for half an hour, the recipe says to drain them and reserve the water. It doesn’t actually say what to do with the reserved water; after some consideration I decided to add it to the soup when the time came. 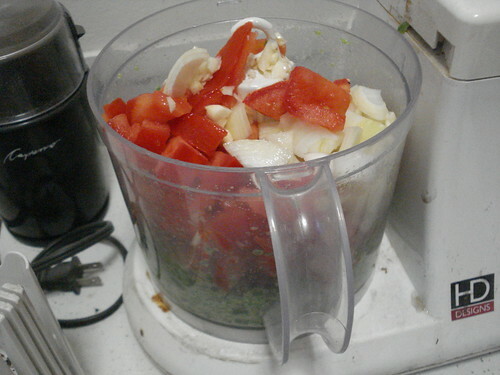 In the meantime, I pureed the peppers with some diced onion, garlic and tomato. Then I heated some oil in a large pot and cooked the pepper mixture for about 10 minutes, then added chicken broth (and the pepper water) and let the mixture simmer for half an hour. I also sliced some boneless, skinless chicken breast and sauteed it until the pieces were fully cooked and nicely browned. I set this aside. And I mixed a few tablespoons of cornmeal with half a cup of water. When the timer for the broth went off, I stirred in the cornmeal slurry, some minced cilantro, some lime zest and some lime juice. 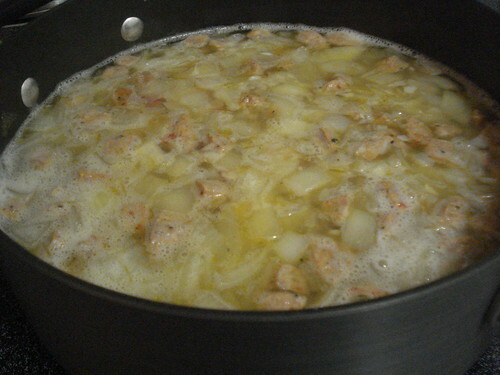 I also stirred in the chicken, but I must note: The recipe never specifically says to add the chicken to the soup. I know it’s supposed to go in, partly because it’s in the name of the recipe, partly because the photo that accompanies it shows chicken in the soup. I expect that sort of sloppiness from a pamphlet, but not from an elaborately designed and produced cookbook. Of course, for an inexperienced cook, adding the chicken is a no-risk option. But the omission of the details about what to do with the pepper-soaking water is more serious; if I’d been wrong, the soup could have been too hot to bear. Fortunately, it wasn’t. 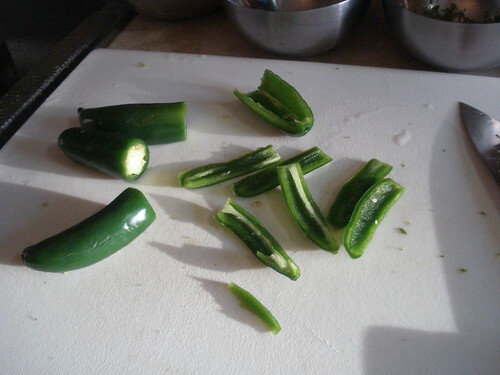 The soup was peppy and flavorful, but not aggressively spicy; the heat of the jalapenos balanced nicely with the bright tartness of the lime juice and the pungency of the cilantro. The soup was a welcome warming dish after a chilly spring afternoon. I made spinach and black bean quesadillas to go with it — sort of a Mexican-themed soup and sandwich supper. Verdict: Success. This one definitely goes into the rotation. I’ve never watched “Hell’s Kitchen” or any of Gordon Ramsay‘s other cooking shows, and I’ve never seen any footage of him yelling at the people under his command. I don’t approve of that sort of behavior, and because of that I wouldn’t have set out to buy this cookbook. But I missed one of the deadlines to let the cookbook club know I didn’t want the selection of the month, then lost the box under a pile of junk on my desk until it seemed too late to return it. Gordon Ramsay’s Healthy Appetite doesn’t hint at any of the “Hell’s Kitchen” temper or conflict. The book brims with beautiful color photos of a cheery blond chef and his delicious but healthy food. In the introduction Ramsay insists he’s been passionate about healthy lifestyle since 2000, and that while “I don’t believe in diets” (which is typically chef-speak for “I don’t count calories and I use butter”) he does believe that good food made with the right ingredients can help people live more healthfully. The right ingredients are of course fresh, locally sourced, and naturally low in fat (vegetables, lean cuts of meat, etc.). The recipes do look good. There are some terrific-looking salad and vegetable dishes, plus a lot of oily fish and whole grains. There are also poached eggs, beef roasts and lamb; there is no sense of deprivation here. Of course everything in the photos is gorgeously plated. And quite a few of the recipes are fast and simple, suitable for weeknight cooking. 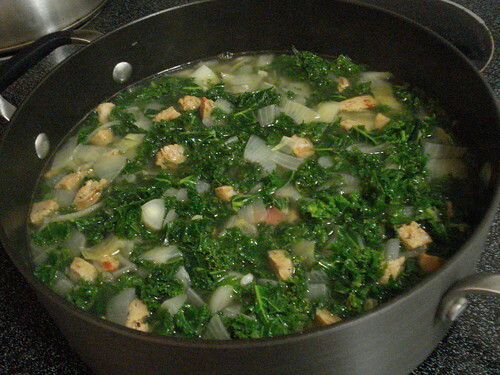 The recipe I chose for tonight — kale, chorizo and potato soup — would be a good weeknight option, though it was also quite satisfactory for a Sunday spent working on other projects at home. It’s also a good winter dish, which made it stand out from the tomato- and pepper-rich beauties that are going to have to wait until the Greenmarket is in full swing. 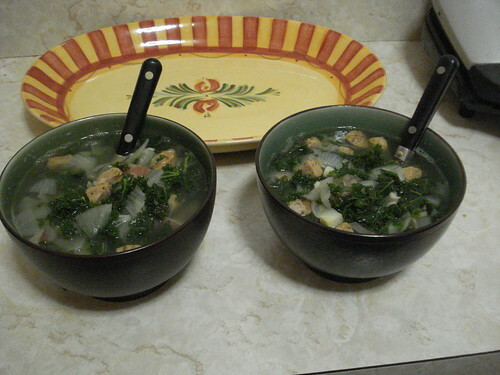 To make the soup I started with my prep: I rinsed, stemmed and chopped some kale, chopped two onions, minced two cloves of garlic, and diced two red potatoes, while Scott diced a couple of links of chicken sausage with jalapeno. (There was no actual chorizo at the grocery store I went to; this seemed the closest thing.) I heated some olive oil in a pot and sauteed the onions and garlic, then added the sausage and let that cook for a few minutes. 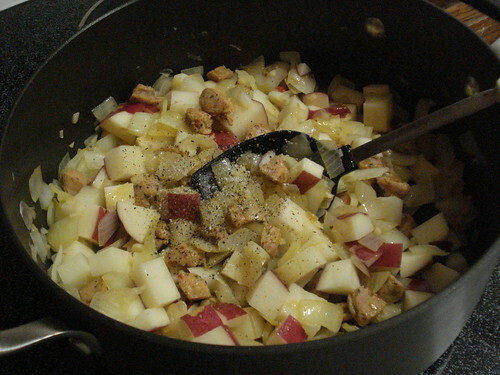 Then I added the diced potatoes, salt and pepper, and some water, brought the mixture to a boil, and let it simmer for about 12 minutes. 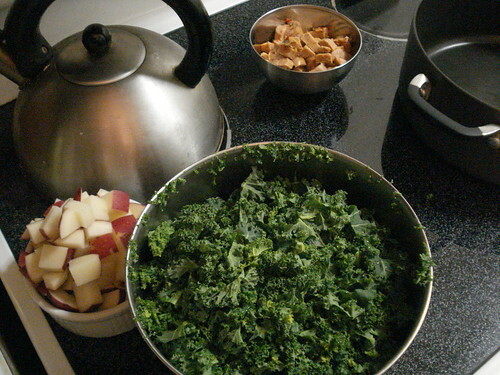 When the timer went off I stirred in the kale and let it cook for another five minutes, then dished up the soup. This was a tasty dish. 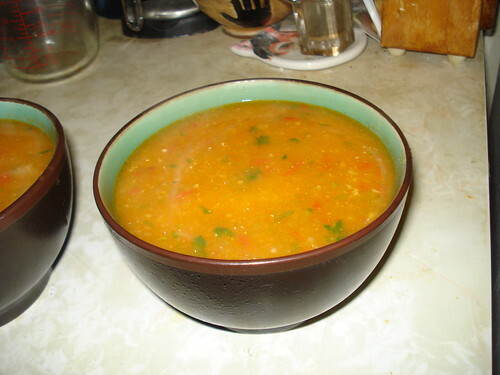 Actual chorizo would have given it a different taste — a more rich, warm peppery heat instead of the sharp heat of the jalapeno — and probably have made the soup a little fattier, though not in a bad way. 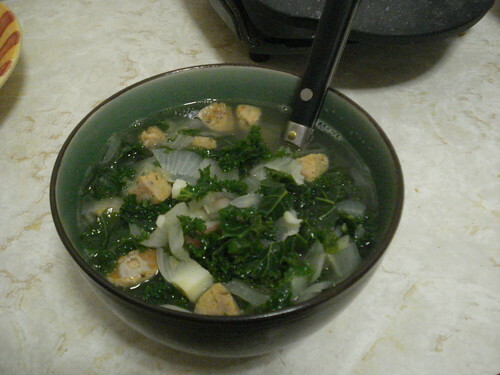 The flavors complemented one another well: rich onion, slightly bitter kale, mild potato, savory sausage. I was afraid the liquid would be too thin, but I think using broth instead of water would have overwhelmed the other flavors. Verdict: Success. 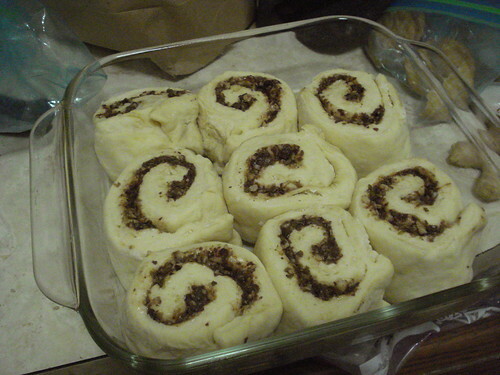 I’ll want to make this again at least once more before the end of the winter. Vegetarian Soups for All Seasons is another in my cache of vegetarian cookbooks, and it’s got some wonderful recipes in it. Delicious, healthy options, representing a range of cuisines. 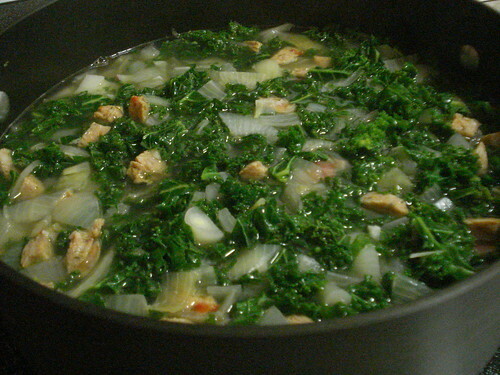 As you might guess from the title, the book organizes soups by season, so it made sense to work from the fall chapter. 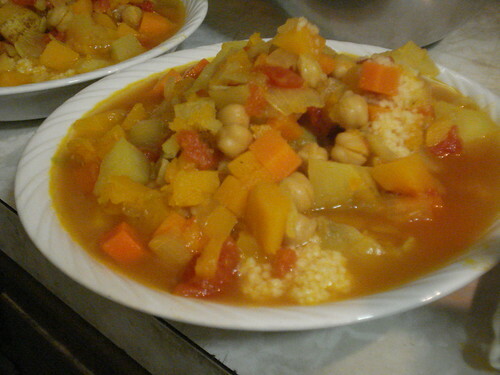 Moroccan-style vegetable stew is a fairly simple blend of root vegetables and a modest amount of spice, served atop couscous. Preparation could hardly be easier. 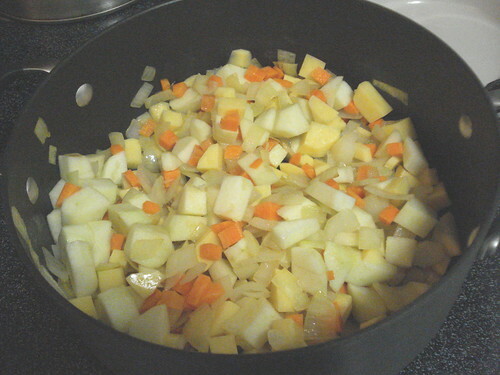 I started by prepping my vegetables: chopping fairly sizable chunks of butternut squash, potatoes, carrots and onions. The butternut squash took a while to cut up because the rind is hard and resistant to safe cutting, but the other vegetables went from whole to chunks in moments. Now it was time to start cooking. 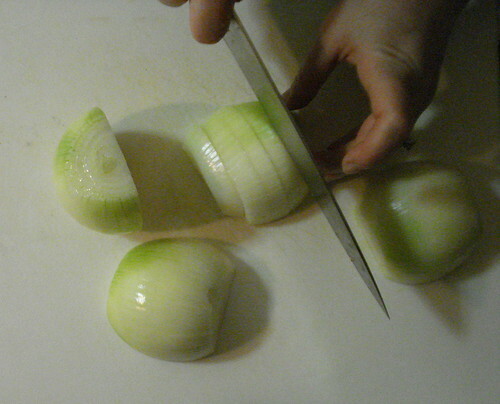 I heated some oil in a stew pot and added the onions, cooking them until they were soft and golden. 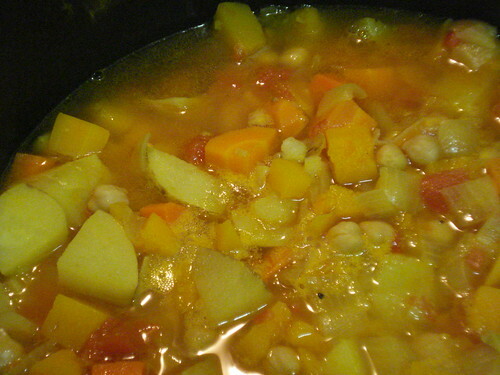 Then I added the squash, potatoes and carrots, plus a can of diced tomatoes and enough water to cover the mixture; I brought this to a boil and stirred in some turmeric and some cumin, then covered the pot and let it simmer for about 45 minutes. During that time I cleaned up the kitchen, then poured a cup of dry couscous into a heatproof bowl and brought two cups of water to a boil. I had to fiddle about a bit to get the water to come to a boil at the time I needed it, just a bit over 15 minutes before the rest of the stew was done, which meant a few passes with the kettle until the timing was right. So just after I’d poured the water over the couscous and covered the bowl to steam, I added a can of chickpeas (drained and rinsed) to the stew, with a little salt and pepper, and let it simmer another 15 minutes. 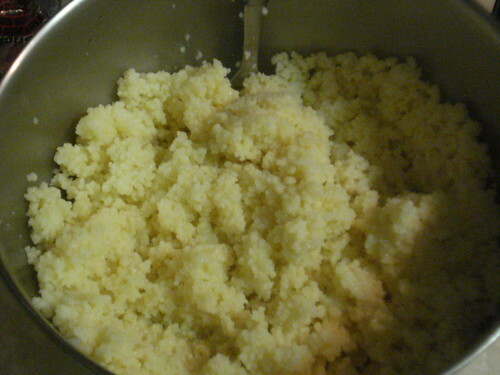 When the couscous was ready I uncovered the bowl and fluffed the steamed nuggets with a fork. 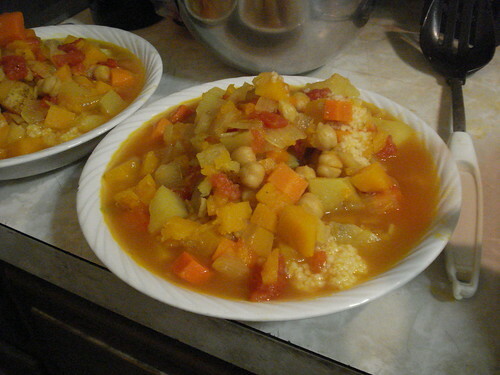 Then I spooned a fairly generous serving of couscous into each bowl, and ladled in some stew. Dinner was ready, with virtually no work required after the chopping — apart from steaming couscous, washing some dishes, and opening a bottle of wine. The stew was tasty, though it needed a bit of salt. 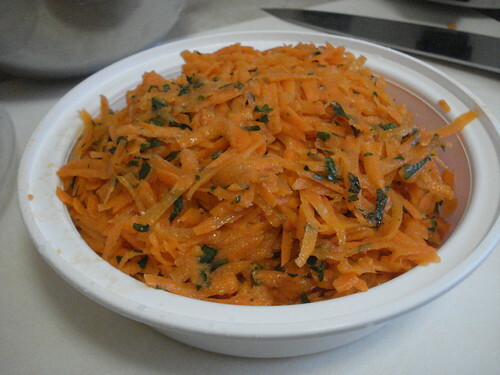 The flavor was rich and savory, and this is one dish that is overflowing with beta carotene. Verdict: Success. 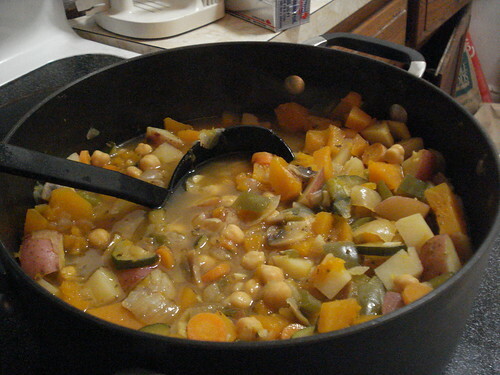 Easy prep, tasty stew, healthy meal. This one goes on the list of favorites.